If you want to surprise your guests with a festive and delicious dish of meat - cook a pork roast glazed with honey and mustard. Pork baked in this traditional British recipe, good hot or cold. half of the ginger root. Prepare the brine - dissolve in water, salt, sugar, add a teaspoon of black pepper, cinnamon, cumin seeds, few cloves, chopped onion, chopped garlic and ginger root. Bring to a boil, strain, cool and soak in this solution the meat. Pork needs to be submerged in the brine completely. Leave the soaked ham in the fridge for a day or better for two. 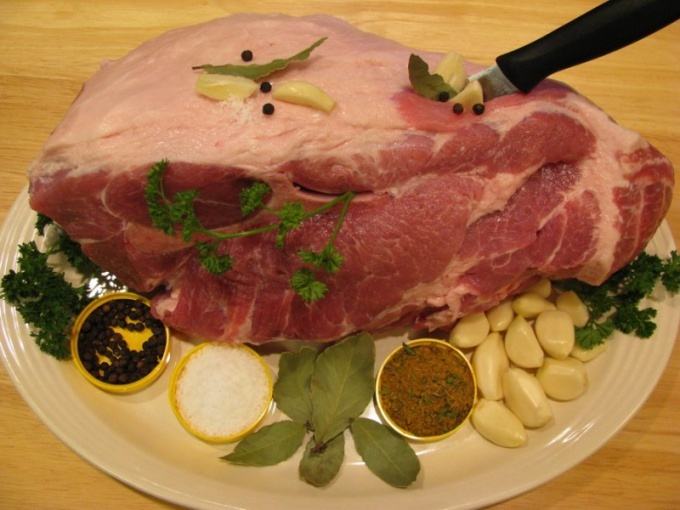 A couple of hours before cooking, pull the pork in the brine from the refrigerator to the meat bought at room temperature. Put it in a dish with high sides. Thoroughly seal the ham with foil on the edges and on top, leaving a small air space. Put the meat in the preheated oven. Bake at 220°C - 230°C for one and a half hours. Remove the pork from the oven and gently loosen from foil. Leave the meat to rest for a few minutes to cool slightly. Prepare the glaze of mustard and honey. To do this, mix honey with mustard powder and mix until thick homogeneous mass. Put the cold ham on a cutting Board and carefully cut the top layer of fat "mesh". Cover the whole ham with a silicone brush, glaze. To decorate stick sticks cloves. Transfer the prepared piece into the dish again and put in preheated oven. Roast pork open about 25 minutes. During this time the ham is nicely browned on top and sides. Get ready the ham, cool slightly and cut into thin slices. According to tradition, baked according to this recipe the pork is served with Apple or cranberry sauce. Do not cut the entire piece at once, sliced the pork will dry quickly and lose the juice. Store ham in the refrigerator, tightly wrapped in foil. Cold meat is great for sandwiches.